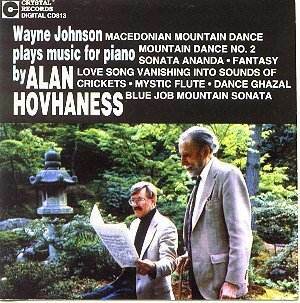 You may not automatically associate Hovhaness with piano music and yet as a glance at his catalogue will show you he has written a great deal of it. There are in fact at least four CDs anthologising his solo piano work. It seems fitting given the contribution Crystal have made to making available his orchetsral music that we should start with this collection. The two Op. 144 mountain dances date from the 1940s when the composer lived in Boston and played these pieces at parties hosted by Armenian and Greek friends. The first work is darkly dazzling - fast and creepy as well as exotic. The second has a strong tinge of the Hungarian skirl you find in Bartók. We move further East in the quiet middle section. He continues the mountain theme (an 'idée fixe' in Hovhaness's music) forty or more years later in the Blue Job Mountain Sonata. This is in three movements. Decorative, sonorous and clean there is no hint of atonalism although the intervals are exotically stropped. Satie and Debussy are close at hand in the Dance Ghazal. Both this work and the preceding hypnotic Mystic Flute (a typical Hovhaness title) date from 1937 and are remarkable both intrinsically and because they survived the great 'bonfire of the vanities' when he burned masses of his early music to force a new start in the 1940s. The Love Song (1979) is a valentine to his wife Hinako. Once again simplicity of a sort you cannot produce unless you have the Elgarian ability to pluck music from the very air is the keynote. Sonata Ananda (1977) proceeds with measured deliberation without a hint of the ponderous. Tranquil limpid healing streams flow through this music. Shadowy zither effects inhabit the tremolo of the middle movement. The final two movements are a dance of the Graces and an essay lost in contemplation of a starlit night sky. The latter is at first superficially close to a Macdowell charmer but soon shows up depths way beyond anything plumbed by that 19th century master. The shiver of the zither, the roll of thunder and the light patter of rain characterise the Fantasy. It is dedicated to the Indian god of music, Tumbaru. This work has a noticeable quotient of dissonance although nothing to create undue alarm. It is divided into ten 'Dans'. It uses some of John Cage's tricks from the Sonatas and Interludes including using various types of 'beater' directly on the exposed strings of the piano. Hovhaness has been written off time after time for his simplicity and use of repetition. I see his music enduring and the fact that new CDs of his music (I Flamminghi on Telarc) continue to be issued is an indication that the public will have no truck with grey and pre-parcelled 'wisdoms'. The fulsome sleeve notes include a firm endorsement of Wayne Johnson's interpretations in both the technical and spiritual domains. I have not heard all four discs yet. This one bids fair to be a strong contender for the one to choose if you must have just one. The latest Hovhaness CD (on its way to me for review at this moment) from Crystal includes Khaldis (from the old LP), a new recording of the Mt. Katahdin Sonata, and Hovhaness himself playing his Fantasy (from the old Poseidon), one of the only recordings available with Hovhaness himself playing. It will be interesting to compare the composer's version with that of Wayne Johnson. Peter Christ is tired of my calling for the reissue of the Ani Symphony (for windband) once available on an rare Poseidon LP. However I still have hopes that the work will be reissued once the sound can be cleaned up. What a pity that the master-tape cannot be found. I wonder if it resides with any members of the two windbands who made the recording?